4/25 Epic Friday Link Up ~Share your posts! Mom Always Finds Out gets creative with her Deviled Eggs! Savy Saving Couple has this sweet smelling DIY Mother’s Day gift idea. Or just pamper yourself with it! Krystal’s Kitsch goes all out with this Cherry Limeade, but she adds a special ingredient that sounds wonderful! I hope you join in this week! I can not wait to see what you all have going on! 1) Leave us a link below! 3) Share the love! Share this link up with your friends and comment on at least 2 other posts on the list! 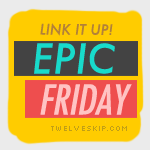 This entry was posted in Epic Friday on April 25, 2014 by Kandi. Hi Jen! Thanks for featuring my blog post this week. Hope you have a great weekend!